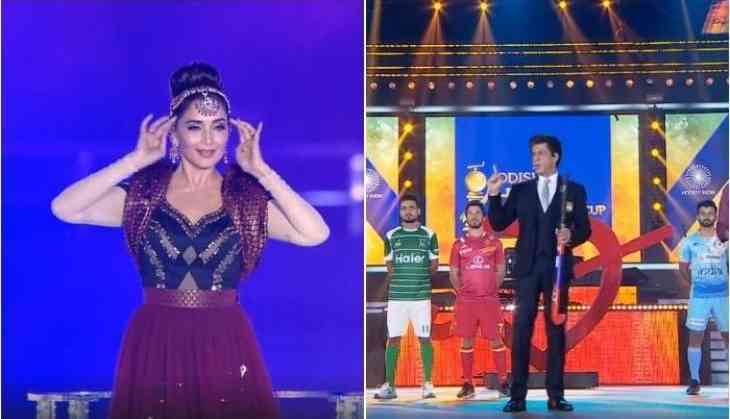 Conveying a powerful message of "oneness of humanity" was the highlight of the glittering opening ceremony of the 2018 men's hockey World Cup here as Bollywood heart-throb Shah Rukh Khan, Madhuri Dixit and renowned music composer A R Rahman dished out enthralling performances, Tuesday. The ceremony showcased first-of-its-kind theatrical production - The Earth Song, which beautifully depicted the theme of the ceremony. The World was declared open by Odisha Chief Minister Naveen Patnaik during the ceremony, attended by all 16 captains. The bilingual script in English and Hindi with snatches of the Bhagvad Gita and philosophy of the Upanishads has been written by Nupur Mahajan. Rahman brought to life his and Gulzar Saheb's composition Jai Hind Jai India' with a live performance, which is the official song and tune of the World Cup. Bollywood star, Shahrukh presented over 2.35 crore collected heartbeats to the captains of the hockey teams participating at flagship FIH event. Speaking on her role in the theatrical production, Madhuri said, "I was absolutely elated in playing the central role in The Earth Song as I particularly identified with the theme of oneness and its universal appeal. Mother Earth is a powerful character and to rise as her at a world stage by way of a live performance was a challenge and a unique opportunity.